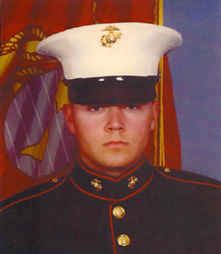 USMC Lance Cpl Alec Catherwood, 19, was killed Thursday, Oct. 14, 2010, by small-arms fire while conducting combat operations against enemy forces in Helmand province, Afghanistan. He graduated last year from Byron High School. The son of Kirk and Gretchen Catherwood, was a rifleman attached to the 3rd Battalion, 5th Marine Regiment, 1st Marine Division, I Marine Expeditionary Force, based at Camp Pendleton, Calif. He was engaged to be married July 2, 2011, to Hailey Patrick of Davis Junction. He was born on May 6, 1991 in Heilbronn, Germany to Kirk and Gretchen (Ernst) Catherwood. He was a 2009 graduate of Byron High School and was a member of the FFA as a Sentry, Boy Scouts, and had a black belt in Tae Kwon Do. He enjoyed athletics, 4 wheeling, mudding in his truck, and shooting his shot gun. He also enjoyed spending time with his family, his fiancee, and was a great friend to many. Alec earned many personal service awards including the Purple Heart, Combat Action Ribbon, National Defense Service Medal, Global War on Terrorism Service Medal, and Korean Defense Service Medal. He is survived by his parents, Kirk and Gretchen Catherwood of Byron; sister, Mikaela (Lance Cpl. Matthew USMC) Montgomery of North Carolina; fiancee, Hailey Patrick of Davis Junction; maternal grandparents, Donald and Mary Ernst of Varna, IL and numerous aunts, uncles, and cousins.